I hope to be back to my regularly scheduled broadcast this week. Looking forward to you being back on track as I really enjoy looking at your photos. Definitely not a Hypericum, it could at a pinch be from the Cassia family. 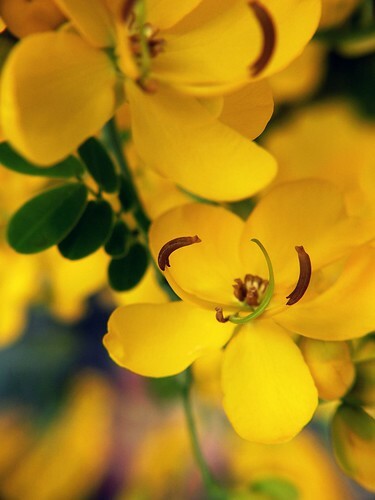 Whatever it is, it is a very cheery yellow flower. Enough to lift anyone's spirits. take your time girl... Love the yellow. Very, very true. It's nice to see yellow flowers at this time of year. The yellow is really bright - giving me a little sun on this gloomy day. The leaves look like it may come from a tree. Beautiful. Lovely flower WW. I love the color too. I really like your new photo and what you did with the filter. MELLOW YELLOW-great photo also Great song.Before your time.was many years ago ..POD. Oh, how I love yellow! You also behind in everything? LOL! Life is passing us by too fast - where are the brakes?? I know that I certainly feel better after seeing this yellow beauty. What refreshment, a break from the heavier colors of the season. oh i wish i had a flower to look at here...freezing today. such a nice photo and i like the portrait of you. it's good. oh yeah, I hear ya! When the days attack they attack! Great photo - can't wait for more!